Nina Orlova, a Russian volunteer in Sochi, shares her impressions of the Winter Olympics host Sochi. Many people I’ve met in Sochi say that they found themselves here by accident or by fate. It’s no different for me. I’ve always been a big fan of the Olympics, and every two years, in summer and in winter, I spend two weeks glued to the TV. 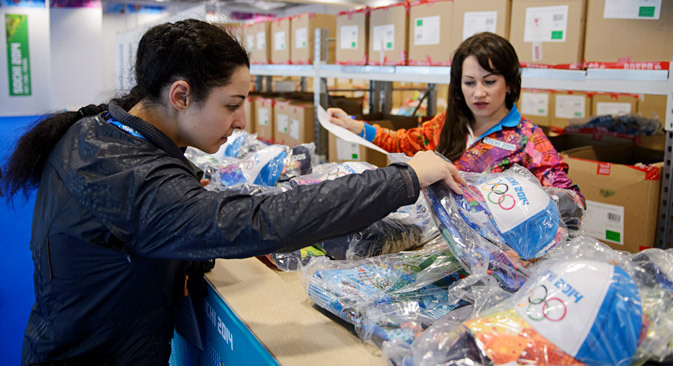 At the same time, experiencing the Olympics personally seemed like an unattainable dream, so when I applied to volunteer in Sochi, I didn’t expect too much. Following the first stage of selection were language exams, tests on intellectual ability, countless, endless tests, then full-time training, online courses and lectures. Finally the treasured letter arrived announcing that Sochi says YES. Pack your bags and hit the road. On my way, I sat on the plane thinking that I’d only truly believe this was happening when I saw the mountain peaks outside my window. The Olympic Games are perhaps one of the few events that truly unite people from every country in the world, and I will be part of this huge event! White-capped mountains are visible from the plane’s window and under the other wing an azure sea extends into the distance – a picture captured by postcards from the Sochi 2014 official photographs. This is the landscape that greets every arrival at the Olympic city’s airport. Warm soft sun, friendly faces, the bright, eye-catching Olympic symbols, a joyful buzz all around – you’re immediately at the heart of what’s happening. The volunteer village by the sea is full of life and movement, and it seems like nothing stops for a minute. It’s a real city, sprawling along the coast east of the Olympic Park to the border with Abkhazia. Noisy flocks of young people are a colorful flash before my eyes. On the balconies of low, cozy cottages you see flags from different countries - Germany, the UK, and France - foreign volunteers are staying in these cottages. All around you hear different languages ringing out. Bulletin boards hang in the hallways of each house, dotted with colorful pages from which volunteers call meetings, look for people who share their interests or want to play board games, or simply share the mood with funny photographs from both work and their free time. Buses constantly come and go from the stops, driving noisy crowds of volunteers between the different ends of the coastal clusters. Someone hurries for their shift, discussing the latest news and sharing emotions with newly-made friends, and someone else is getting acquainted with the Olympic Park and surrounding area for the first time. After getting settled, the first job for new volunteers is to pick up their accreditation and uniforms. Everyone is patient, indifferent to the endless lines typical of our country. Peace and goodwill reign, and the process is over. There’s a new day ahead, a new chance to look at the Olympic Park with different eyes, to appreciate its beauty and not to run from the beginning of one line to the end of the next. The Olympic Games are ahead! Nina Orlova is a Russian Olympic volunteer in Sochi.